Each day, PVF receives thank you letters and photographs from the countless teachers and students who benefit from our teacher resource grants. These thank you notes remind us of why our immediate-response grants are so beneficial for classrooms that are often underfunded and in need of additional resources. Recently, we were invited to experience a warm thank you in person by visiting Lighthouse Community Charter School in Oakland to meet with recipients of our grants. During the presentation, we were updated on projects that our grants supported. 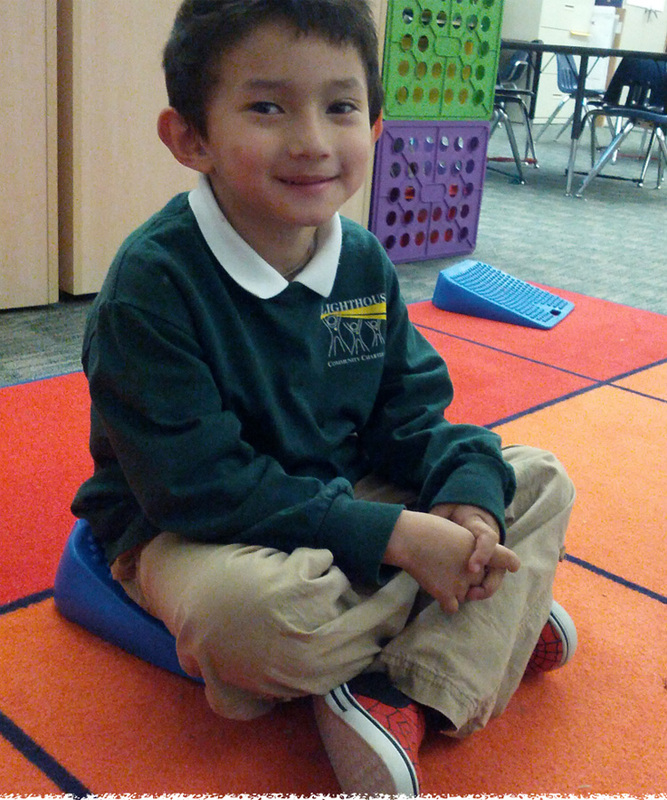 A kindergarten student sits on one of the sensory resources purchased using PVF’s Special Education Resource Grant to concentrate in class. A kindergarten teacher used a Special Education Resource Grant to establish a library of sensory resources for his students who struggle to concentrate and remain still. Four of his students showed us the tools that their teacher had purchased for them, such as a lap weight, a band to tie to a chair for tapping, and a one legged stool to swivel on. It was a delight to see how the children utilized the tools to better concentrate and learn. A counselor received a Visiting Artist in the Classroom Grant to establish a therapy group involving medicinal drumming for boys. Members of the Black Student Club requested an After School Program Grant to conduct a screen printing workshop as part of Black History Month. We saw the final products of this screen printing workshop – their official club t-shirts, which they wore proudly. Another presentation was by two 6th grade students who attended the Bill Nye Climate Lab at the Chabot Space and Science Center through funding from the Science Resource Grant. The students described in detail how they learned about climate change in a hands-on way. They even mentioned how their class was so inspired by what they learned that they decided to write letters to President Obama about the Keystone Pipeline. Members of the Kitchen Crew, recipients of the After School Program Grant, proudly show off their healthy creation. Students also discussed Kitchen Crew, a club for 3rd through 8th grade students to learn how to cook healthy meals. Through PVF’s After School Program Grant, the Kitchen Crew bought equipment and ingredients to make food including truffles, mason jar salads, salsa, and more. They even catered the winter dance and sold their creations at lunchtime! To show off their new skills, the Kitchen Crew made banana chocolate ice cream from scratch for PVF – it was the perfect ending to an already sweet experience! This entry was posted in Uncategorized and tagged education, Oakland, program grants. Bookmark the permalink.